HEMPSTEAD, New York (CNN) -- A majority of debate watchers think Sen. Barack Obama won the third and final presidential debate, according to a national poll conducted right afterward. Sens. 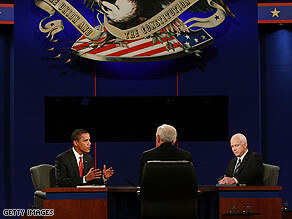 Barack Obama and John McCain debate face to face Wednesday night. Fifty-eight percent of debate watchers questioned in a CNN/Opinion Research Corp. poll said Democratic candidate Obama did the best job in the debate, with 31 percent saying Republican Sen. John McCain performed best. The poll also suggests that debate watchers' favorable opinion of Obama rose slightly during the debate, from 63 percent at the start to 66 percent at the end. The poll indicates that McCain's favorables dropped slightly, from 51 percent to 49 percent. The economy was the dominant issue of the debate, and 59 percent of debate watchers polled said Obama would do a better job handling the economy, 24 points ahead of McCain. During the debate, McCain attacked Obama's stance on taxes, accusing Obama of seeking tax increases that would "spread the wealth around." But by 15 points, 56 percent to 41 percent, debate watchers polled said Obama would do a better job on taxes. By a 2-1 margin, 62 percent to 31 percent, debate watchers said Obama would do a better job on health care. Sixty-six percent of debate watchers said Obama more clearly expressed his views, with 25 percent saying McCain was more clear about his views. McCain won in two categories. Eighty percent of debate watchers polled said McCain spent more time attacking his opponent, with seven percent saying Obama was more on the attack. Fifty-four percent said McCain seemed more like a typical politician during the debate, with 35 percent saying Obama acted more like a typical politician. "Independents tend to prefer debates that are dominated by substance and light on discussion of personal characteristics," said Keating Holland, CNN polling director. "The perception that McCain attacked Obama gave red meat to GOP partisans, but it probably didn't help McCain with independents." iReport.com: Who won the debate? "There was a notable gender gap as well," Holland said. "Women thought Obama won the debate by a 62 percent to 28 percent margin. Among men, Obama's lead was narrower, 54 percent to 35 percent in Obama's favor." During the debate, McCain demanded to know the full extent of Obama's relationship with William Ayers, a 1960s radical. But the poll suggests that line of attack may not resonate with Americans. Fifty-one percent of debate watchers said Obama's connection to Ayers didn't matter at all to them, with 23 percent saying it mattered a great deal. The audience for the debate poll appeared to be a bit more Democratic -- and a bit more Republican -- than the U.S. population as a whole. Forty percent of debate watchers in the survey were Democrats and 30 percent Republicans. CNN's estimate of the number of Democrats in the voting age population as a whole indicates the sample is about 3 to 4 points more Democratic than the population as a whole, but also about 2 to 3 points more Republican than the population as a whole. Eighty-eight percent of Democrats questioned in the poll said Obama did the best job, with 68 percent of Republicans saying McCain performed best. Among independents, 57 percent said Obama did the best job, with 31 percent backing McCain as the winner of the debate. The candidates first debated in Oxford, Mississippi, on September 26. Fifty-one percent of debate watchers polled by CNN and the Opinion Research Corp. said Obama won that debate, with 38 percent saying McCain performed best. The second presidential debate was held in Nashville, Tennessee, on October 7 and 54 percent of debate watchers polled said Obama won, compared with 30 percent who said McCain did the best job. The running mates, Democratic Sen. Joe Biden of Delaware and Republican Gov. Sarah Palin of Alaska faced off in Saint Louis, Missouri, in the single vice presidential debate October 2. Fifty-one percent of debate watchers polled said Biden won, and 36 percent said Palin won. The post-debate polls do not reflect the views of all Americans. They only represent the views of people who watched the debates. The CNN/Opinion Research Corp. poll was conducted by telephone Wednesday night, with 620 adult Americans who watched the debate questioned. The survey's sampling error is plus or minus 4 percentage points.